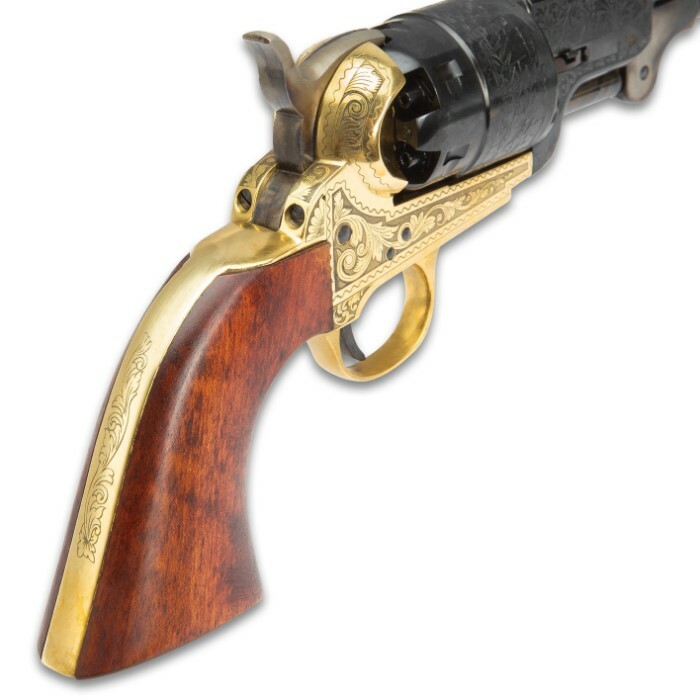 Traditions Colt 1851 Navy .44 Caliber Black Powder Revolver - Fully Functional / Working Historical Reproduction - Octagonal Blued Barrel; Lever Loader; Brass Guard, Frame; Engravings; Walnut Grip | BUDK.com - Knives & Swords At The Lowest Prices! Notorious gunfighter "Wild Bill" Hickok fired many guns in his day, but none were as feared and infamous as his Colt 1851 Navy Revolver. 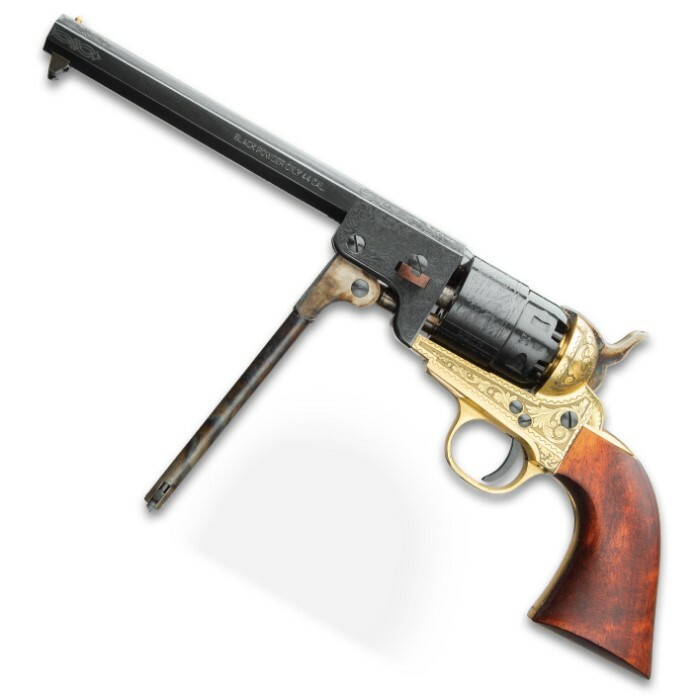 Now you can experience the same deadly firepower wielded by Hickok, dozens of other storied Wild West criminals, as well as thousands of Union soldiers, thanks to Traditions Firearms' fully functional, historically faithful 1851 Navy Revolver. 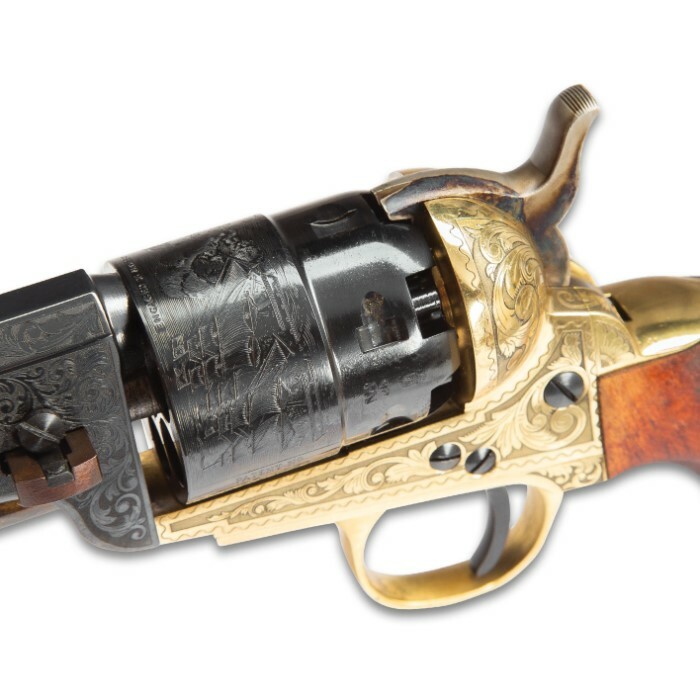 This .44 caliber black powder revolver mirrors the Colt 1851 Navy version commonly known as the "London Model," distinguished by its octagon barrel and lever-style loader. Reliable and easy to shoot, the original Colt 1851 helped drive the expansion of the American West and was even one of the sparks that ignited the Civil War. 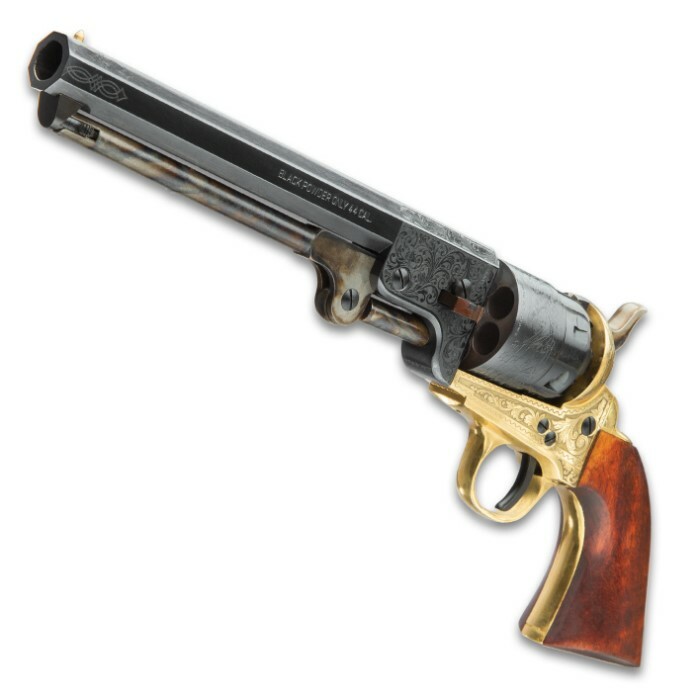 Although Union soldiers relied on many different types of sidearms for short range and close quarters combat, revolvers like the Colt 1851 were unique in that they had the ability to fire several rounds per minute before having to reload. As such, these then-high tech guns were largely issued to officers and mounted soldiers. Traditions Firearms' working replica features myriad fine, historically accurate appointments, like a 7 3/8" blued steel octagonal barrel, brass guard and frame, and handsome walnut grip. There's no question - this classic handgun provides an authentic 19th century shooting experience. But unlike its more-than-150-year-old original counterpart, you can count on Traditions Firearms' modern version to fire safely and aim true every time, when used as directed. There's nothing like black powder - the smell, the sound and the feel is legendary. 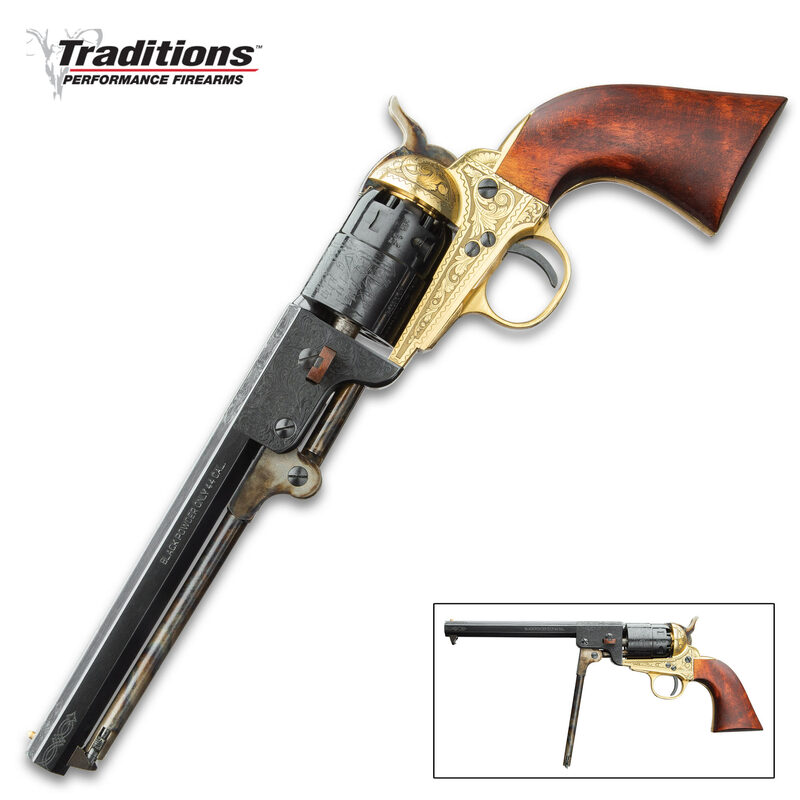 Keep this rich "tradition" alive with Traditions Firearms - order the .44 caliber 1851 Navy Revolver today! The 1851 Revolver also makes a great gift for muzzleloader enthusiasts; Civil War buffs; fans of Wild West history, cinema and literature; and gun aficionados of all types.